VICTORIA continues to track ahead of New South Wales on grain receivals in eastern states, which GrainCorp said have this week hit 672,000t, while in South Australia, Viterra has now received 1.63 million tonnes (Mt) to take total receivals from both bulk handlers to 2.3Mt. 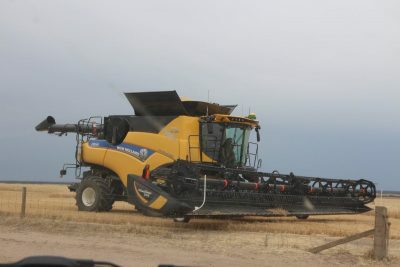 Harvest across South Australia has slowed after showery weather set in last week. Photo: HerbyAg, Cleve. In its latest weekly harvest update, GrainCorp said harvest in northern New South Wales and Queensland had continued despite rain disruptions, and receivals were trickling in. In southern NSW, GrainCorp has reported grain quality was holding in the face of rain disruptions and in Victoria, harvest activity week has spread south and east into the Wimmera and central regions. In South Australia, Viterra’s harvest report said its network had received 272,966t in the week to November 25, with close to 150,000t delivered to sites on November 19 alone. Rain and cool conditions throughout last week slowed harvest activity across the state’s grainbelt. In Viterra’s western region, barley and canola have continued to be than main commodities received on the Eyre Peninsula. Cooler weather prompted an increase in pulse deliveries, and wheat deliveries also increased. In the central region, Ardrossan, Bowmans, Port Giles, Snowtown and Wallaroo received the bulk of the intake for the week. In the eastern region, most deliveries were barley and canola, and the Frances and Tintinara sites received their first deliveries for the season.